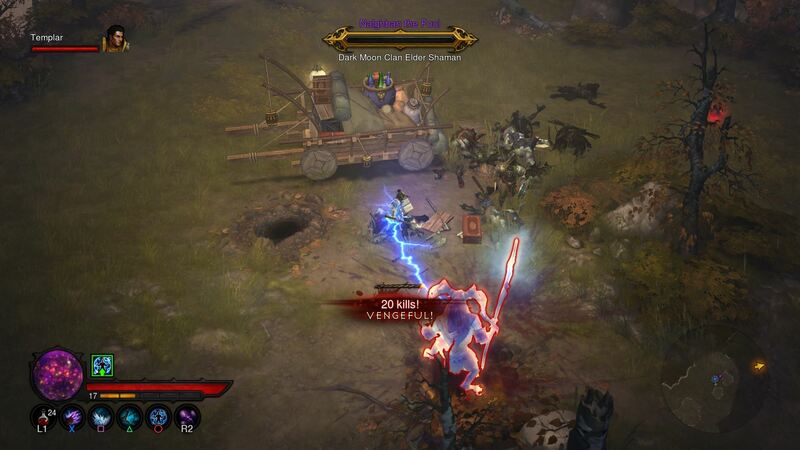 When Diablo III came out on PC, I played it and thoroughly enjoyed it. When Reaper of Souls came out, I played it and thought that it refined and improved the game a hell of a lot. There have been further updates to the PC version recently which have added ladders. I haven’t checked out the latest set of PC updates, but that is because I’ve been busy with the Ultimate Evil Edition which came out on the new-gen consoles a few weeks ago. This new console release includes the base game along with Reaper of Souls and I’ve been playing on the PlayStation 4. I’ll state right from the top that I haven’t been able to make use of the multiplayer features yet. I can’t play local co-op as I only have one controller (way too expensive for new ones) and I haven’t been online when my friends who own the game have been available. That’s a great shame as some of the mulitplayer features sound like really good fun. If I do manage to explore the multiplayer action, I will endeavour to write about it another time. My main concerns coming into the game were how Blizzard were going to get a game which has long been defined by frantic mouse clicking and keyboard bashing to work on a small console gamepad. I was pleasantly surprised to find that the Dualshock 4 is a perfect tool for the game. 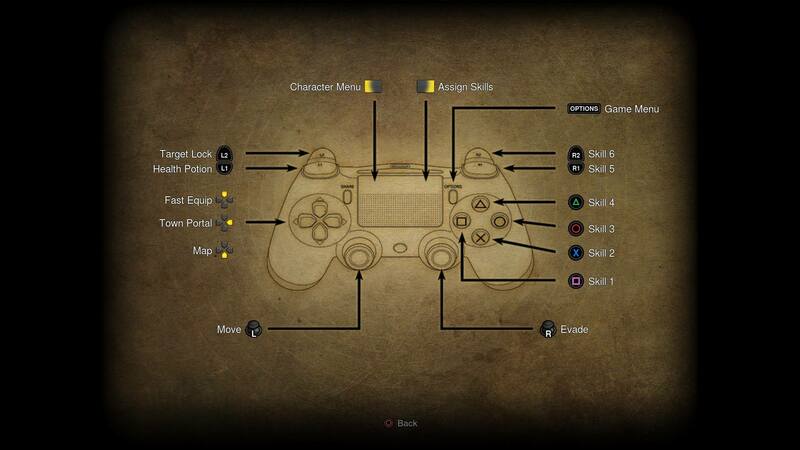 The Xs and Os along with the L and R buttons are automatically asigned to different skills or health potions while the touchpad takes you straight to your inventory and skills. 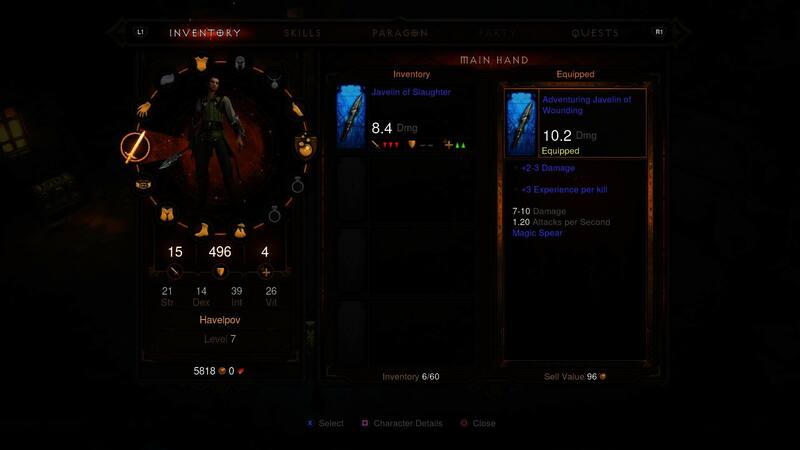 As you can see in the above image, your inventory is displayed on a lovely radial menu. It lets you quickly flick between your different inventory slots and then choose what you are equipped with. When you pick up items, you see green up arrows and red down arrows representing whether they are of benefit to your offence, defence and vitality. It lets you quickly decide whether to equip items, though of course you can still open up each item to see the detail on what magical properties it might contain. Everything from managing your skills and your follower to reviewing the lore books you collect is handled in a similar menu system. It makes things easy to manage and after a short time of playing, my concerns over how they port had been handled were put to bed. The game looks gorgeous, running in 1080p and I’ve not experienced any major slowdowns, even while playing as a wizard with lots of shiny spells to cast. In-game action feels fairly similar to the PC build post-Reaper of Souls. There is plenty of loot, and the loot tends to be at a level you can use and there are a lot of fun magic and rare items to pick up. There also seems to be a nice number of unique legendary items that you can collect from events and random dungeons. Somewhere along the line I collected a special gift that I could send to one of my Diablo playing friends. It is a nice idea to see implemented, but as I haven’t received one yet, I don’t really know how useful the gifts really are. The route of the game is the same as on the PC as you work through the story chapter by chapter. I’m still not entirely convinced on all of the chapters of the game, but for details on how the campaign unfolds, check out my review of the original PC release. I do find it somewhat frustrating that you can’t jump straight in with the Adventure mode, you have to complete the game first. It somewhat makes sense as you will then have built up an understanding of the game mechanics and be at high levels, but sometimes I think it would be a great laugh to just jump into Adventure mode as a brand new character so you can pick and choose your battles. If you have played Reaper of Souls on the PC, then unless you are going to make use of the multiplayer features, I don’t think you will get much more out of this version of the game. However, if you haven’t played the game since the Reaper of Souls updates, I would recommend picking up this Ultimate Evil Edition to blast through the game with the balance changes already implemented. 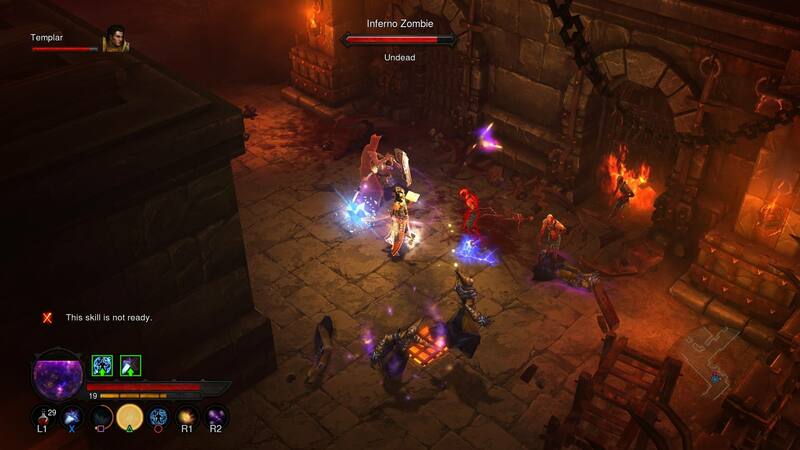 On the other hand, if you’ve never played Diablo, then what are you waiting for? This is one of the best action-RPGs in the land and is very much worth a look. Platforms Available – PlayStation 4, Xbox One, PlayStation 3 and Xbox 360.